After a bitter and intensely fought battle against the forces of evil, or an all-night round of hide-and-seek against a little girl (I forget which), I turn in early in the morning, scoff some victory bread and victory cheese, then head off out of town to do some victory hunting. 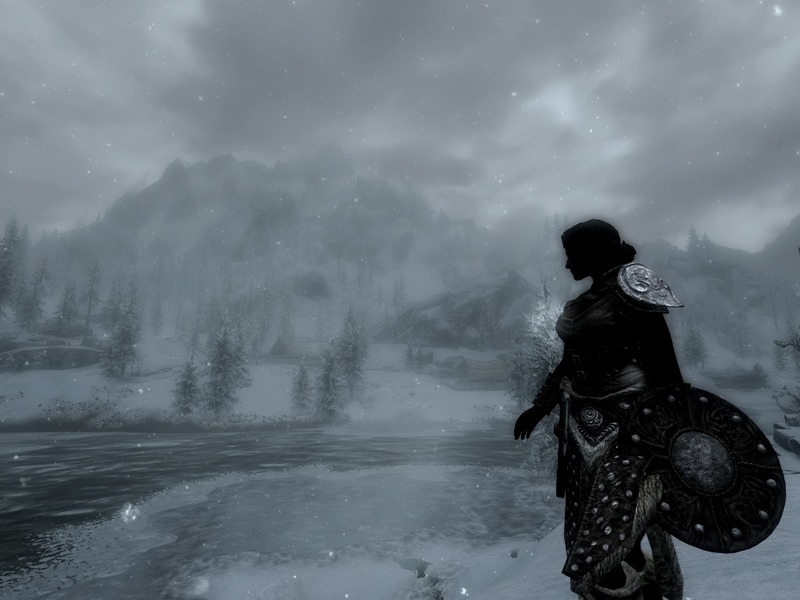 Whiterun is pleasant, and I’ve barely touched the surrounding countryside, but I’m suddenly feeling very outdoorsy, and decide I should travel some more before I settle down. I’m on my way out of the main gate when I realise I should get a better weapon first, though. By the main gate, it seems some Khajit (cat-people) have set up camp outside. Were they here when I came in? I honestly don’t know. Kind of hope not, otherwise I’m more of an idiot that I’d thought. There are tents and fires, and people working leather and generally camping about, so I say hello and chat a little. Most have nothing to say, but they’re friendly, and one is sat cross-legged in a tent. Sitting cross-legged automatically means you’re pretty wise, and this guy is sitting cross-legged in the entrance to a tent, on a rug. He’s practically Cat Buddha. Ri saad is his name (I would personally have guessed “Tibbles”), and he tells me a little about his people. 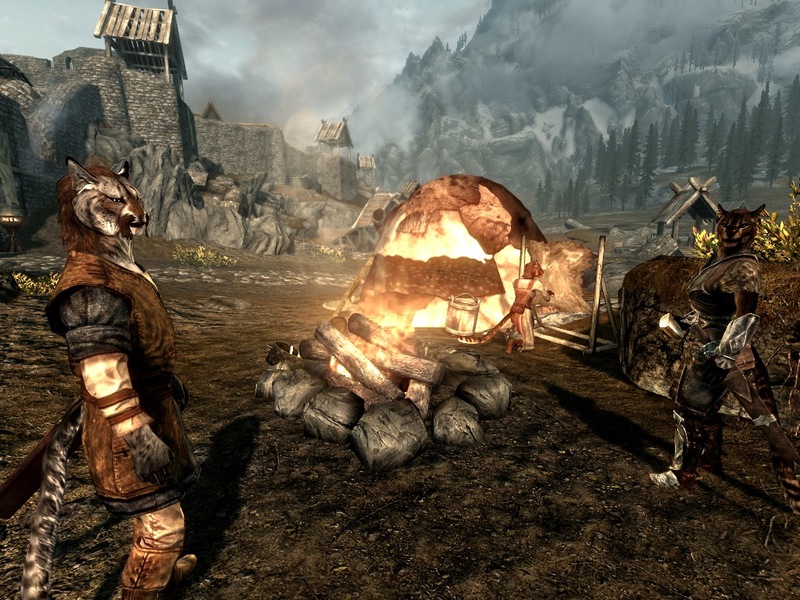 Seems that in Skyrim, catmen are essentially furry gypsies, and get shat on even more than most foreigners by the locals. There are several troupes of them milling about the province though, as they’re keen merchants and saw an opportunity for profit on the roads here, what with the war and all. Sort of makes sense. 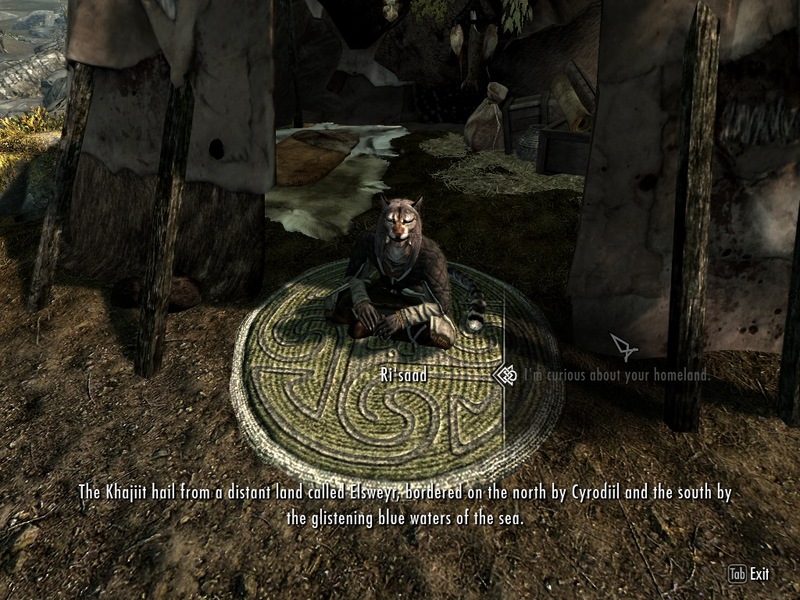 As is typical of a Khajit, Ri saad complains that his people are unfairly stereotyped as criminals and thieves, then offers to sell me some lockpicks. Because there’s nothing worse than getting locked out of your tent, right? He also offers an axe. Shoot them in the eye, then lop off their arms! This is tempting. Okay, let’s do it. I’ll lose the speed of the dagger, but the axe will put some power into my blows. It took over a week, but with the armour, shield, healing spell and now an axe, I’m finally off the bottom rung of the badass ladder. And with that, I decide to start afresh. Yo Bjorlam! Take me to … uh… where do you go again? Oh, christ. 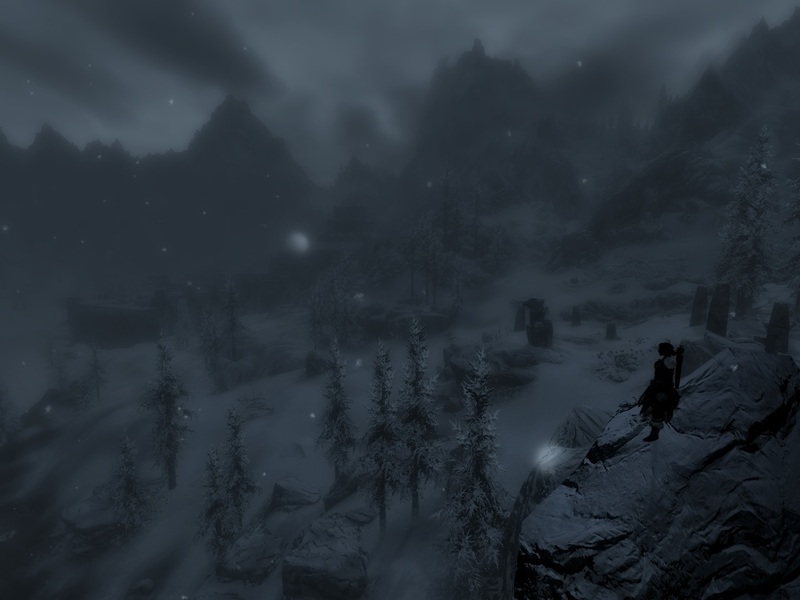 Okay, I know Falkreath, and I’ve heard Solitude mentioned a few times. Can’t remember why or what anyone said about it, though. Does that mean I should go there because it’s famous, or that I should avoid it, because everyone was saying how terrible it is? Damn it. This is why I should pay attention. 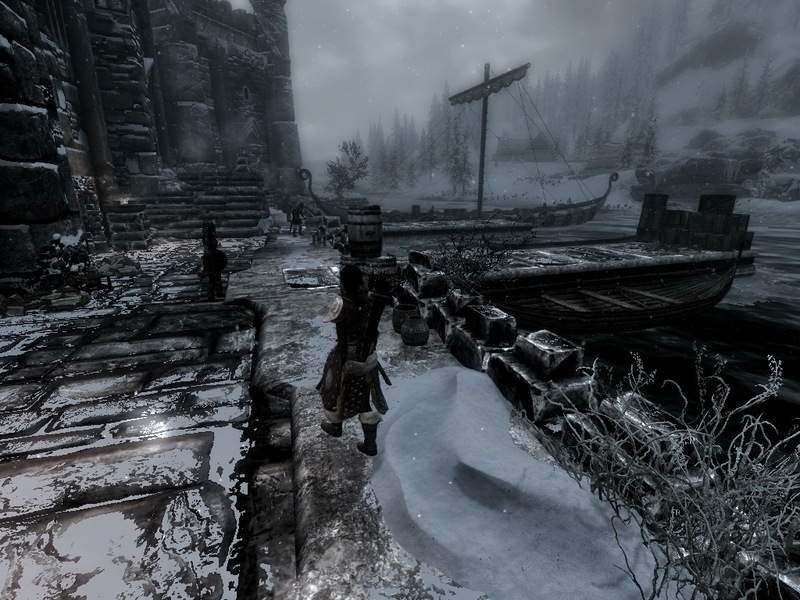 Picking a town pretty much at random, I ask Bjorlam to take me to Windhelm. He tells me to climb in the back, so away we go! It’s dark when I arrive. And oh my god is it cold. And unwelcoming. And miserable. I’ve only just got here and already this feels like a terrible mistake. I head into what I think is the … city? Town? Fort? It’s too dark to make out, but I seem to be walking across a huge bridge. It’s slow going and there’s nothing to look at. Really, I can’t even think of anything to say about it. It’s just drab and dull and depressing. Jeez. Maybe it’s nicer inside. It is not nicer inside. I suppose I should just be glad the guards let me in, and haven’t torched the city to burn out the dragons or something equally cretinous. Come to think of it, this place looks like an invading army might have to actually fight to get in. Hmm. Maybe this is where the Nords hide their smart people? 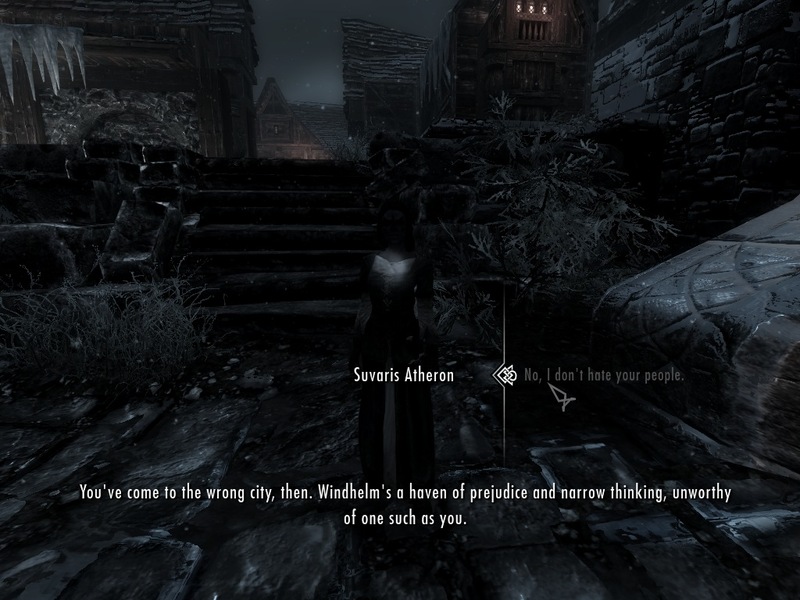 The first people I meet inside the town are a couple of morons being racist at a dark elf. Ah. Maybe this is where the Nords hide their BNP? Not sure if I can take these two, so I just hover nearby in case it turns really ugly, and eventually they leave. The elf asks if I’m a racist, too. I don’t think it quite works like that, dear. Disappointingly, there’s no conversation option starting with “I’m not racist but…”. Great. So I’ve gone from happy, safe, relatively warm open country town, to a dark, frozen craphole full of bigots. I’d best watch my back around here. Good thing I bought that axe. Up ahead is a large inn, set in the centre of the main square. Seems as good a place to start as any. Inside I face one of the racists, Rolff Stone-Fist, who blathers on about elf lovers and go back where you came from and coming over here stealing our jobs and if you like dark elf so much why don’t you go live there and I definitely don’t blame all my problems on a convenient bogeyman honest guv. Yawn. You live in a world where an untrained, penniless foreigner with a criminal record can become self-sufficient within a week by picking flowers. And you’re, what, 35? Get over it, guy. You’ve nobody to blame for your failure of a life but you. And maybe the Bretons. Goddamn Bretons. Ooh, I can resist magic, ooooh. I’m so magical, it’s like, innate for me, oooooh lah de dah. I’m not boring at all! You might think that the path opens up into a square or something ahead, right? It doesn’t. It’s just more dreary grey corridors. I wouldn’t be surprised if I ran into Jack the Ripper. On the plus side, there’s a door up ahead. 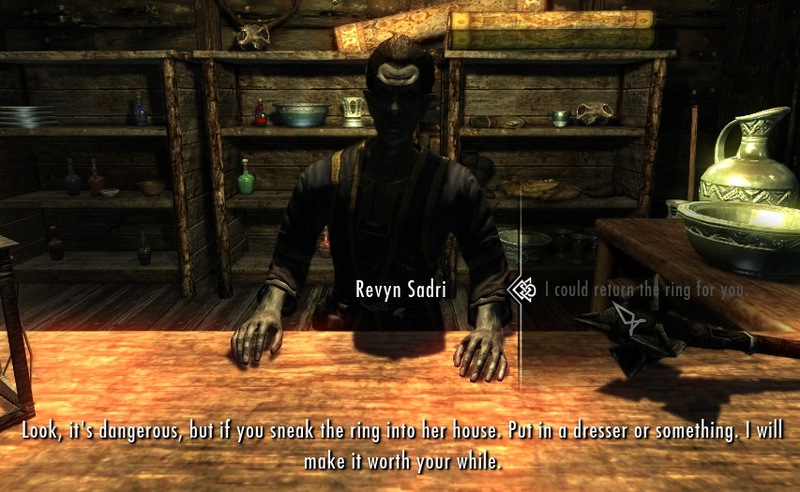 Another dark elf, Revyn Sadri, owns a second hand shop, and what’s more, he has work for me. It’s a curious one. He’s come into possession of a stolen ring, and wants to give it back to its owner, Viola Giordano, without anyone finding out he bought from a thief. To do this, he’s willing to pay me to sneak into a woman’s house and shove the ring down the back of her sofa. I guess this could work. It shouldn’t be too tricky, and I could use an excuse to try out my sneaky skills without committing a real crime. Okay so there’s trespassing, but this is for a good cause. It’s un-theft. De-stealing. Antavarice. Go on then. It’ll give me motivation for looking around some more, which I badly need before I take my own life. Following the alley round, I look into the New Gnisis Cornerclub, a dumpy, empty tavern with no beds. Where am I supposed to pass out? No thanks. Between Revyn and the club’s single patron, I learn that this neighbourhood is where dark elf immigrants are segregated from the natives, because screw dark elves. The Jarl doesn’t really care, and they don’t go back home to Morrowind because Morrowind is an even more miserable dump than Windhelm. At least here they have individual dialogue, and job prospects beyond standing motionless in the rain for all eternity. That kind of thing matters in a home, you know? Further ahead still, and down, is a large town gate. I push through, and find myself on the docks. Is it daytime already? I can barely tell the difference. Everything’s so grey. I feel like my axe should have an underslung chainsaw attached. The dock is a little more lively than town, with a man doing the swordy-grindy-make-better thing, and a few sailors and guards knocking about. But the warehouses set into the wall are empty, dusty and dark, and the locals have nothing but tales of suffering and trouble with pirates and Bad Smugglers. That includes some offers of rewards, but I’m not about to go tangling with organised gangs any time soon. 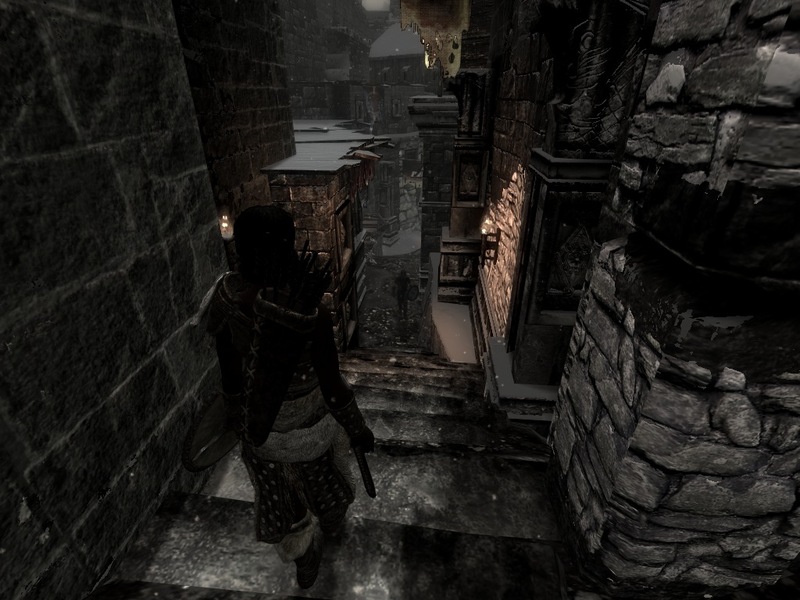 Instead, I follow the city walls around (the city has walls! Actual walls! They go all the way round and everything), and with a hop and a jump over some icy slush, I’m away. That’s a bit better. Still cold and desolate, but at least I’m away from those dingy corridors. I can’t see there being much of a profit out here, but it beats living in the ghetto. Right away, I run into some fat, grey, shuffling things. Locust! No wait, the other one. Horkers! It’s an unexciting fight. 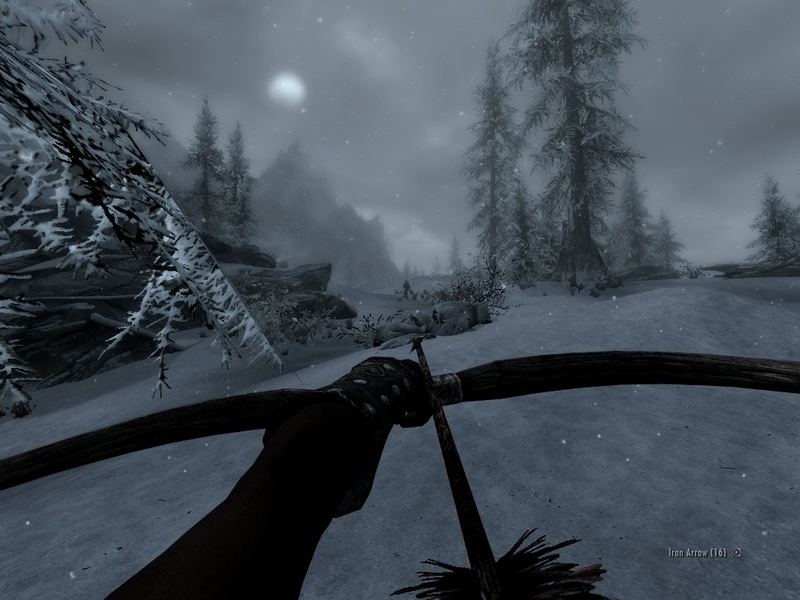 I loose a couple of arrows, since they’re hopelessly slow and I have lots of time, and hit them with my Fury spell. That has no real effect, as they’re already attacking me, but at least I know I can do it. They absorb a lot of punishment, but soon stop moving, and I take their meat and a tusk. That’s lunch paid for already. Speaking of which. 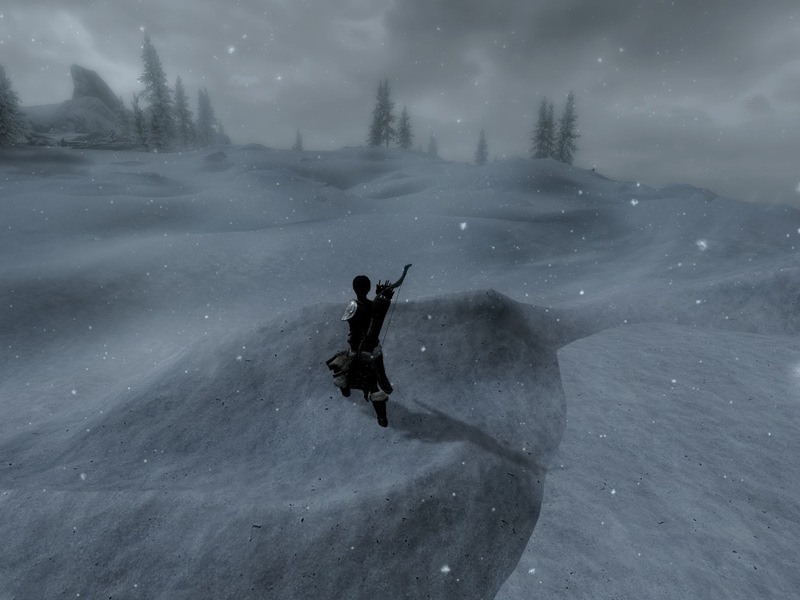 I pause to eat some apples and a bit of meat, then it’s off again into the snow, and man, does it feel like I’m wandering into a frozen wasteland. Screenshots can hardly do it justice. There’s a genuine sense of beauty edged with foreboding about the whole area. I don’t feel directly threatened – I can see anything coming a mile off – but, well. It won’t be an easy life out here, and the atmosphere says it loud. Click to embiggen! Up ahead are some dark menhirs, and after cautiously passing between them, I think I spy a solitary figure up ahead, watching. Obelix? By the time I’ve snuck up the hill to get a better look, there’s no sign of anyone. Bit creepy, but I probably just imagined it. And it turns out that these sinister-looking menhirs aren’t warding off some great evil, either. They’re to denote a shrine. It’s a shrine of… candle? I leave a thistle branch I picked up a few days ago as an offering, and receive a blessing from the god of candles, giving me +5 fire resistance and a 20% bonus to wax. And yes, I really should start paying attention to which gods I’m dealing with, one day. There’s not much to say about the rest of the afternoon. 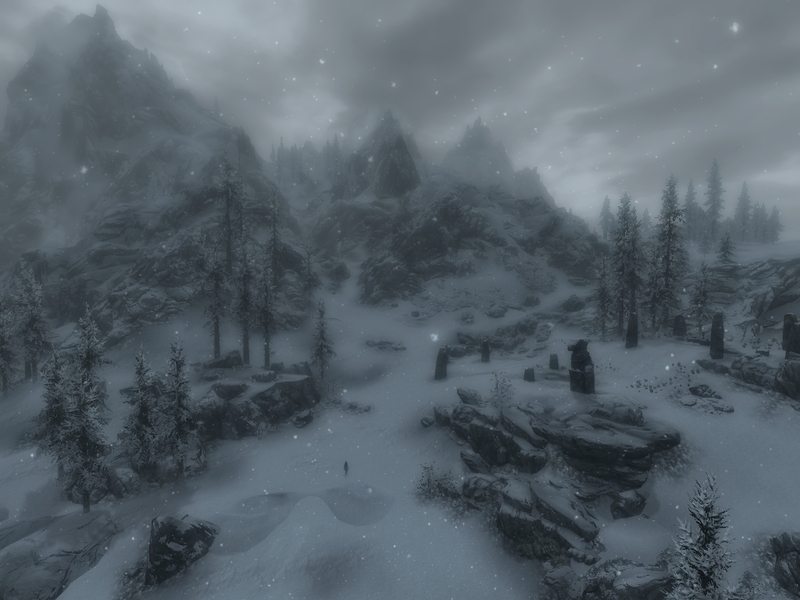 It consists of clomping around in the snow, and despite being stark and monochrome, it’s surprisingly enjoyable. 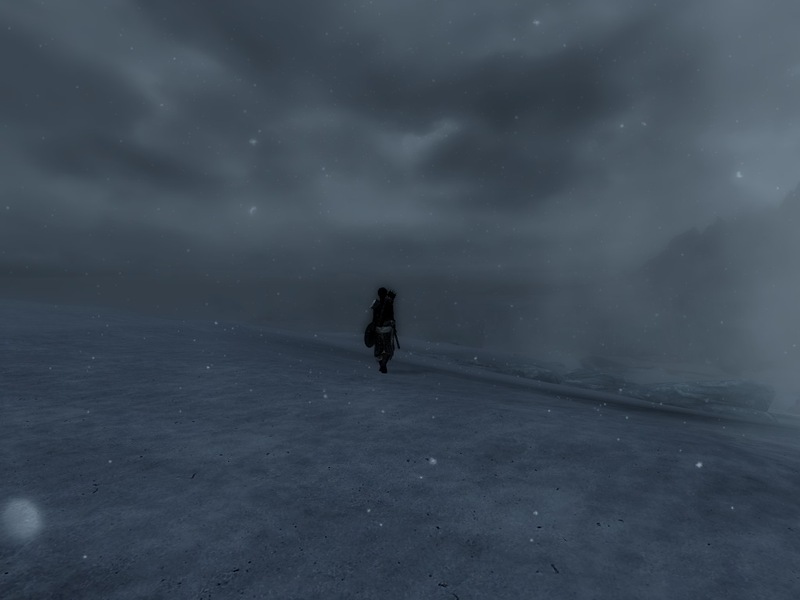 Snow is blown off drifts in dusty gusts of wind, distant howls of wind and animals alike offer some strange sense of company, and I totally shot a wolf in the face. The way I see it, there are only two reasons for anyone to be wandering alone out here. The first is that it’s someone like me, and the second is that they’re up to no good. This guy can’t be me, because I’m me, and I’m already out here watching him. So clearly he’s up to no good. Quod erat demonstrandum, innit. I move closer, and get into position to take the shot. Pow! I got him! And er… well. You might have noticed that he’s no longer standing there, and figured he fell over dead, out of sight, right? Well, he didn’t. He turned invisible. This does not bode well. 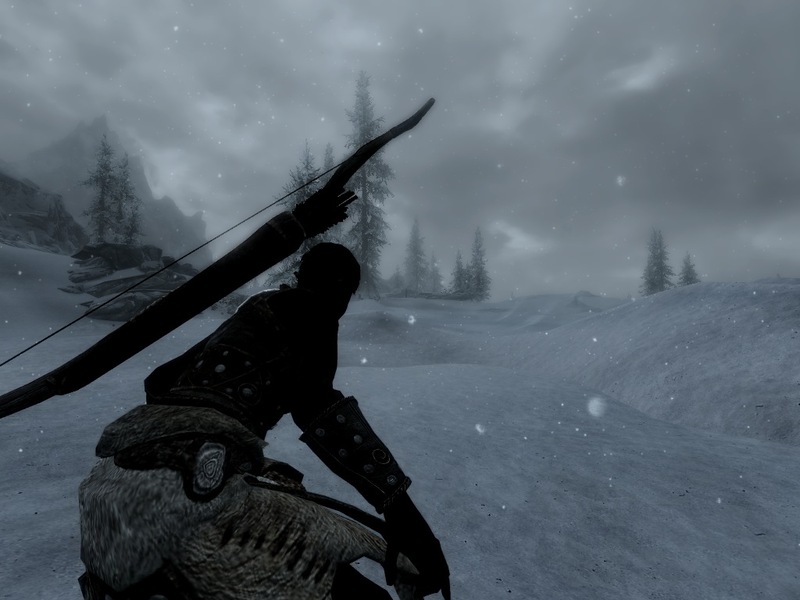 Fortunately, he cancels his psychotic, invisible charge of vengeance when I put my bow away, which he interprets as a conciliatory sign of remorse rather than preparation to run screaming all the way back to Windhelm. 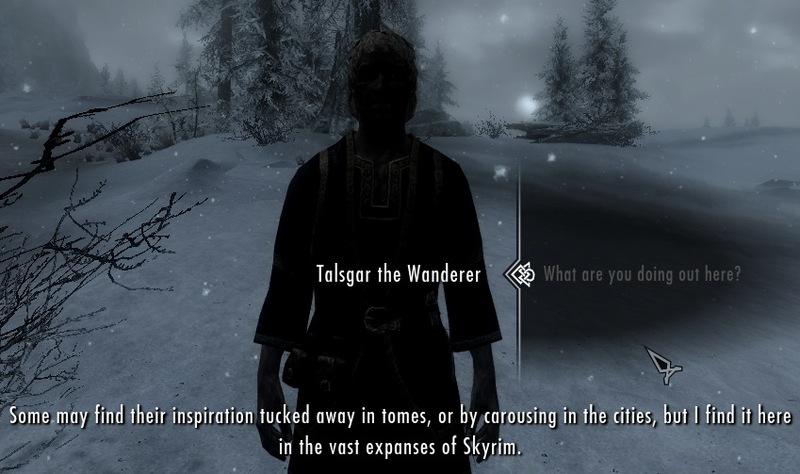 So he reappears, ceases combat, and introduces himself as Talsgar the Wanderer, a poet. He’s inspired by the wilderness and adventures and so on, hence all the sinister lurking in the snow. Fair enough, I suppose. He’s an awfully good sport about my attempted murder, too. Maybe this happens to him all the time? He probably thinks this is just very dedicated heckling. In any case, that shot took my archery skill up a notch, which in turn pushed me up a level. Hurrah! I pick another 10 points of stamina (figure I’m going to need to run a long way aaaaany second now), and the ‘overdraw’ skill, giving all my archery a damage boost. 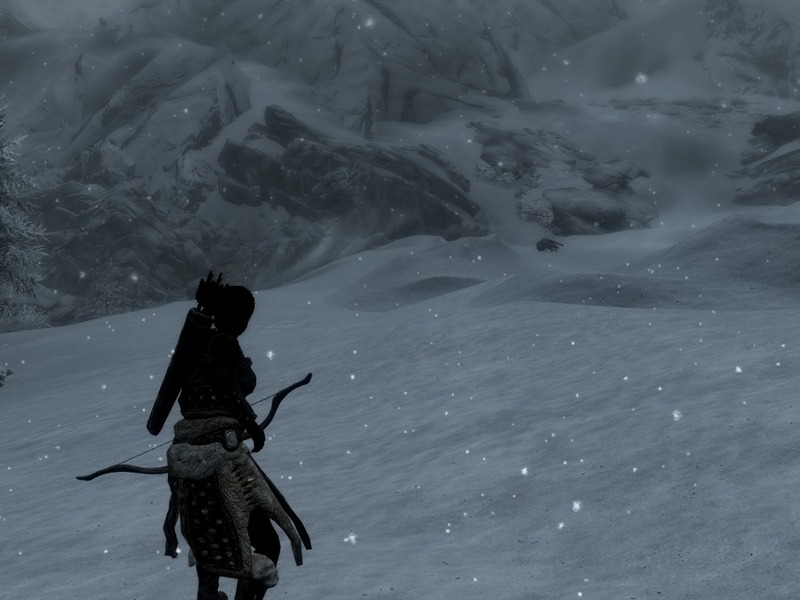 And since I’ve achieved something today, have a bag full of pelts, and it’s getting dark, it’s time to head back to town. I also arrive seconds too late to rescue an unknown hunter, who has somehow been cornered against the water by a horker, and subsequently gored to death. Oaf. I kill the horkers and search his body, since I’ve no other way of finding out who he is and whether there’s anything I can do, but nope. I could tell the guards I suppose. I’m sure they’ll react with efficiency and professionalism to any situation that doesn’t call for immediately putting an arrow in someone’s eye. Aha. Ahaha. Ahahaha. Aaah. 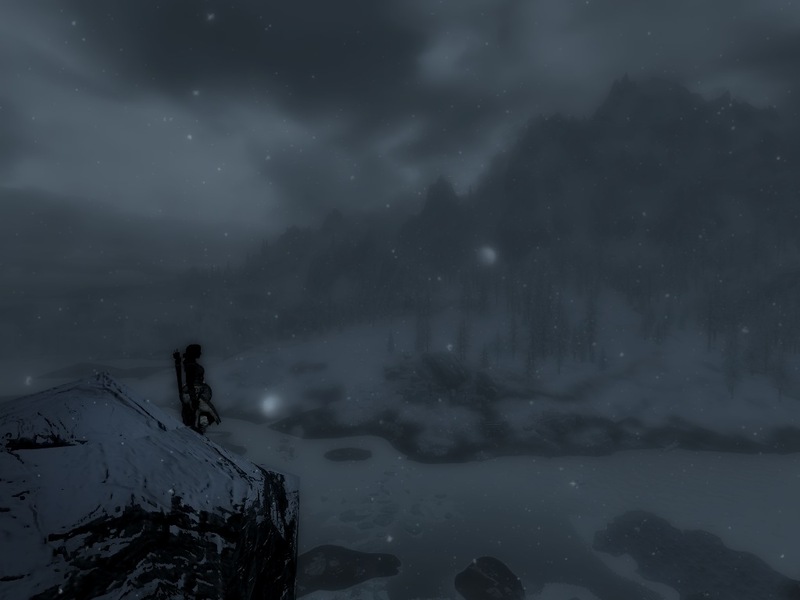 The frozen north has some great scenery. 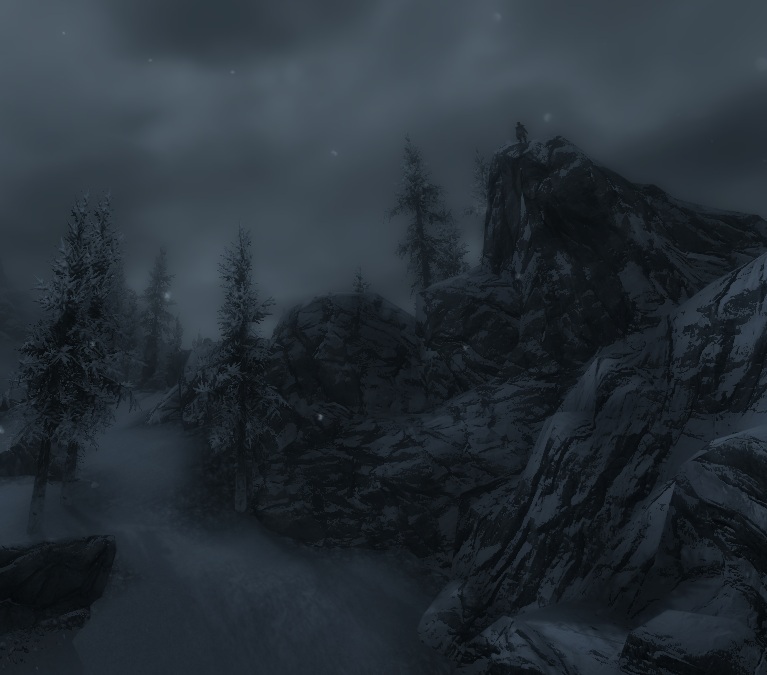 If you have the chance, head south of Windhelm to see the hot springs (unless you’re avoiding it to differentiate yourself from That Other Diary?). The hot springs and the swamps of Morthal are my favorite places in the game right now, as I play an alchemist and they offer an abundance of valuable material. Of course, screenshots of swamps. . . ? Maybe not so exciting. Thanks for the tip. 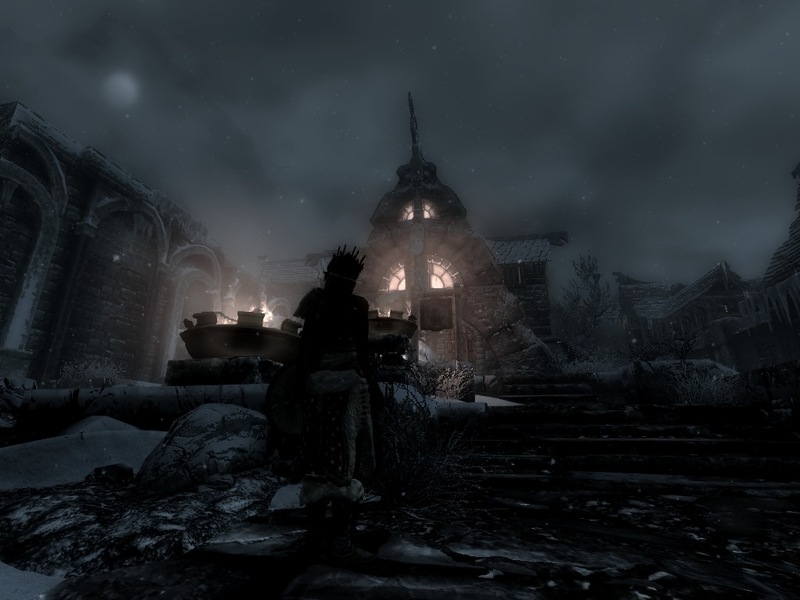 I was already well over a(n in-game) week ahead when Nordrick reached Windhelm though, so it won’t be an issue. Ymelda has other plans. Some of the scenery really is spectacular. I played for a while on an enormous TV screen (nothing I could capture though, just mucking about to see how it looked), and spent an age just slowly walking around, admiring the view. They really did some impressive work with the landscapes. I am sorry. There will be more – loads more. I’m just really busy lately, and unfortunately the site can’t be my number one priority, however much I enjoy it. It’ll mean more in the long run though, I think. Anyway, I should have time this weekend. If not, you are hereby authorised to hit me with sticks. More important thing is more important, totally understood and encouraged. Seeing as though Nordick recently kicked the bucket, you’re all that’s left. Just discovered this. Read all the entries for all four games in a single evening. Good stuff. Starting to remind me of living in oblivion, it’s a slippery slope this “not updating” business, I hope it’s nothing too serious keeping you from posting.